GeoAuthor® provides tools to enhance TIGER/Line Shape Files while maintaining TIGER topology. This includes changing geometry and attribute data, adding or removing line work and regenerating layers for day-to-day mapping applications. GeoAuthor® from International Computer Works, powered by MapInfo Professional, delivers the correct measure of ease-of-use and sophistication to leverage investments made in existing GIS data providing the user with the tools to enhance TIGER/Line Shape Files while maintaining TIGER topology. GeoAuthor® is designed to provide the user with an easy-to-use set of tools with which to create a project for a county or county equivalent using TIGER/Line Shapefiles provided by the US Bureau of the Census. Once the project is created the GeoAuthor® permits the user to make edits to the geometry and tabular attributes of the map data. This includes realigning TIGER to local geometry (i.e. parcel maps, aerial photos, etc. ), adding missing features (i.e. streets, water, landmarks, etc. ), modifying tabular attributes (i.e. names, address ranges, ZIP Codes, etc.) and use the diagnostic routines in GeoAuthor® to confirm the integrity of the data. GeoAuthor® also includes GeoPoints© which is designed to create and maintain geographic databases of points and tabular attributes. GeoAuthor® provides object based tools making it easier for you to manage, edit and update your base map starting with data that other agencies have already built. Boundaries from closed areas of the linear network which can then be used to define city limits, precincts, response zones, etc. Fence lines, power lines, etc. Designed for ease-of-use, GeoAuthor® is strategically positioned to help you use the power of GIS data in concert with other ICW applications to address the mission critical needs of your office. 1. Maintain your center street line file with tools designed to manage the data. 2. Create closed boundaries that share the same geometry as local data. 3. Distribute the enhanced data (17 to 30 layers) to users who can benefit from a shared map library. 4. 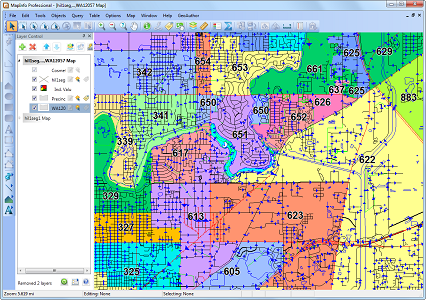 Use the enhanced data for redistricting school zones, election precincts, or 911 dispatch. 5. Geocode data using ZIP5 as an attribute of the street segment. 1. Change Name Change the name of a single segment or for all segments with the same Reference Number. For roadway features the user may edit a primary name and up to 5 alternate feature names. 2. Populate your map enabled web site with data whether you serve up GIS or display maps for your end-users. 3. Use the enhanced data with vertically integrated applications such as GeoSchools, GeoChoice, GeoPoints SQL, GeoBuilder, or GeoElections also from ICW. 4. Link the demographics of your target audience to the enhanced boundaries using the positional accuracy of your geocoded data. Pricing for this product does not include GeoAuthor MATS. For techincal support and/or the purchase of GeoAuthor MATS contact: International Computer Works, Inc.
Digital River, International SARL is the authorized reseller and merchant of the products and services offered within this store.